The health benefits of cloves have been valued for centuries. Although small, this spice packs a punch that is beneficial to your health. Like the history of many herbs and spices can be traced back hundreds if not thousands of years Cloves, are no exception. They were a treasured commodity and highly prized and a valuable resource with the Ancient Romans along with Arabs traders of the times as well. So much so that cloves, were one of the most valued and treasured spices to have. During the Chinese dynasty cloves (in particular the flower buds) were given to anyone who was to have an audience with the Emperor. The people would chew the cloves prior to an audience before the Emperor. The reason for this was not to offend the Emperor should someone have had bad breath. Cloves along with Nutmeg are native to the Malucca Islands, which is now part of the Spice Islands in Indonesia. The Portuguese, who had control of the spice trade off these Islands until the Dutch wanted their two cents worth (in this case cloves were worth more than their weight in gold at the time). The Dutch even went to extremes by destroying any clove trees outside of their area. This did cause problems, as a native tradition was to plant a clove tree each time a child was born which created that link between the child and the tree of life. You can obviously see that this did not please the Natives either. However as greed seems to take precedence over necessity, others wanted their bit as well. Soon cloves were growing in many other countries around the world. According to Wikipedia, Indonesia and Madagascar are the two top producing countries of cloves. The French word “clou” which means nail, is where the word cloves received their name. 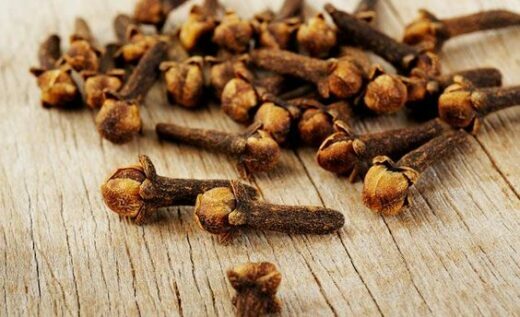 This is due the how much cloves look like nails. Cloves when in the flower bud stage are left to dry which results in them turning brown. This is how many would know them to look like as in the top image above. Cloves have some powerful medicinal properties. The sweet aroma of cloves is due to Eugenol, an essential oil in them. The essential oil contained in cloves bring forth a very potent group of antiseptic, antibacterial, anti-fungal, and Anesthetic properties to name a few. As we have read further above, cloves mask any unwanted odour that may create bad breath. Bad breath can be the result of various issues such as halitosis, tooth decay, bleeding gums and more, this along with eating certain foods that can react and create that bad breath. It is within these properties that help to work against the bacteria collected in the mouth that cause bad breath. To do this you can simply chew some pieces of cloves or create a gargle with some cloves in the form of a tea and have this three times a day or more if required. The Eugenol Oil within cloves not only eliminates bad breath but also acts as a natural anaesthetic. Applying clove oil to the affected area will help in relieving pain due to the toothaches or abscess. 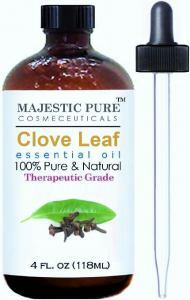 Clove Oil is popular and used by many dental practices. In Fact, they are included in the dental rinses and mouthwashes. Many types of toothpaste contain oil of cloves that help fight against bacteria along with providing antiseptic support. The anti-bacterial properties of Cloves help to ease sore throats and coughing. Add some cloves to your tea and drinking regularly can certainly help with sore throats. Due to its stimulative properties, essential oil compound can improve blood circulation as it stimulates the skin to draw up the blood closer to the surface when applied directly to the skin. Due to the antiseptic properties, Clove essential oil would be great to have around the home for situations such as wounds, infections, and burns. Improve Digestion and Digestive disorders. Cloves help support the secretions of pancreatic enzymes, compounds necessary for proper digestion and nutrient assimilation. As part of improving digestion, other digestive disorders can be reduced such as nausea, gastric irritability, and flatulence. Direct use can cause irritations to the skin. Clove oil may irritate the skin for some people. To be safe it is also best to dilute the oil with either water or better still carrier oils such as Almond. Excess use internally can be dangerous. Any Internal use should be under the guidance and or advice of a healthcare practitioner preferably one with knowledge of essential oils. A greater choice could be that of a qualified Aromatherapist or Naturopath. Do not use cheap grade oil such as fragrant oils when dealing with health. This may be nice to fragrant the room but are imitation oils and not pure. Always ensure that your essential oil is marked as therapeutic grade oil. Below is an example of such oil available via Amazon. When you click the image, you will find a choice of other companies that also produce fine essential oils. You can choose whichever one you feel best and most comfortable with. Do you have any experience with the use of Cloves? Your comments are important and it would be great to hear of any experience you may have had regarding the use of cloves. Please place your comments below and your experience could help someone else go forward in theirs. We are all vital cogs in the wheel of life. Sending many blessing and may you always go forward in life.